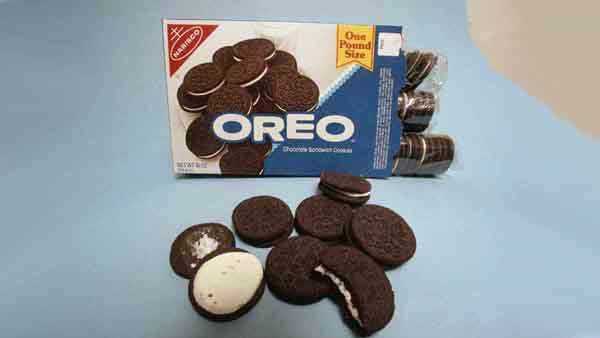 The National Biscuit Company sold its first Oreo cookies to a grocer in Hoboken, New Jersey, on March 6, 1912. HOBOKEN, New Jersey (WLS) -- An iconic American snack food is marking a big birthday Friday as Oreo celebrates 103 years of selling the popular sandwich cookie. The National Biscuit Company sold its first Oreo cookies to a grocer in Hoboken, New Jersey, on March 6, 1912. Kraft Foods now sells Oreos, the country's top selling cookie. The appeal of the Oreo has always been the way you eat it, says pastry chef Joanne Chang at Boston's Flour Bakery. There are so many options, including dunking it in milk or twisting it to scrape off the filling with your teeth. Kraft says 50 percent of Oreo eaters pull apart their cookies before eating. Women twist them open more often than men. Over the years, Oreo has expanded on its original concept and has offered many varieties for all types of occasions and holidays. In 1974, "double stuff" cookies were added with double the cream filling. Other flavors have been added, such as peanut butter, fudge, vanilla and mint. Kraft says Oreo cookies are now available in more than 100 countries.